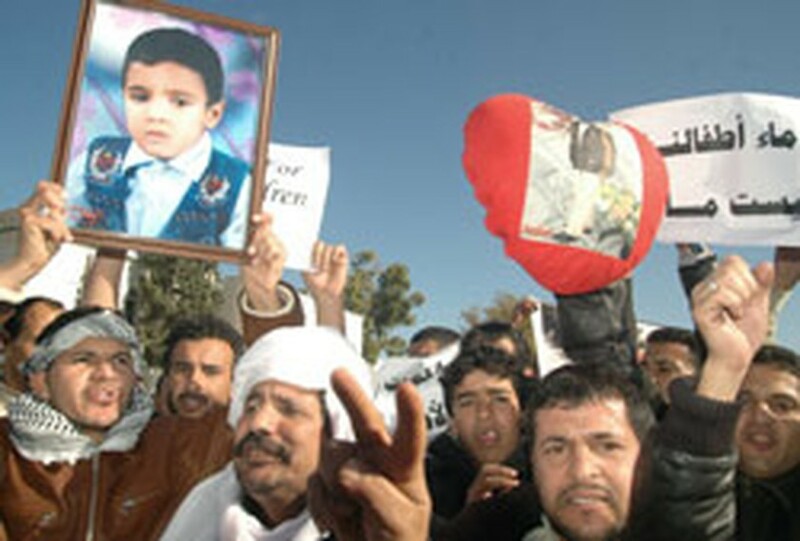 Libyan men hold portraits of children infected with HIV during the final court, Dec. 19, 2006. Six foreign medics face execution by firing squad or hanging after being convicted by a Libyan court of deliberately infecting hundreds of children with the AIDS virus. The death sentence against the five Bulgarian nurses and Palestinian doctor detained for the past seven years was greeted with shock and outrage in the international community but with cheers by relatives of the victims. The defendants -- from behind bars in the dock -- burst into tears on hearing the verdict while the families of sick or dead victims celebrated, singing and dancing outside the heavily protected Tripoli court on Tuesday. Defence lawyer Othman Bizanti told journalists an appeal would be filed before Libya's supreme court within the legal time-limit of 60 days, in the last recourse open to the medics. The accused were charged with infecting 426 children with HIV while they worked at Al-Fateh hospital in the Mediterranean city of Benghazi. More than 50 have since died. All six had pleaded not guilty. Bulgaria said it categorically rejected the "absurd" death sentences and called on Libyan authorities to intervene. "The whole court case was compromised and covers up the real cause that sparked the AIDS epidemics in Benghazi," said a joint statement by Bulgarian President Georgy Parvanov and Prime Minister Sergey Stanishev. The European Union presidency condemned the sentence and appealed for clemency, while EU Justice Commissioner Franco Frattini said he was "shocked" and warned the ruling could damage ties between Tripoli and the 25-nation bloc. The White House said the United States was "disappointed in the verdict". The medics, first detained in 1999, had already been sentenced in May 2004 to face a firing squad before the supreme court ordered a retrial following a December 2005 appeal. And Libya's Justice Minister Ali al-Hasnawi suggested it may not be the end of the case. "Libyan justice offers the accused the possibility of a complete revision of the case. The supreme court can modify, reduce or annul the verdict," he told a press conference. "I am happy with the verdict, which shows the impartiality of the Libyan justice system," Abdullah Moghrabi, lawyer for the families, told AFP. The court also ordered the Libyan state to pay the families between 250,000 and 900,000 dollars for each victim. Relatives carried portraits of dead or sick children outside the courthouse as security forces fired into the air to keep the crowd at bay. "Death to the children killers!" read one banner.